After running around all day Saturday with back to back soccer games and then a wedding, which my wife helped plan, we got in a good day of gaming on Sunday. Started out playing a couple quick matches of Hive, oddly enough requested by my daughter. Like this lighter abstract game and it doesn't get played nearly enough for me to have any dominant strategy. I won the first round pretty quickly but the second was hotly contested with Gabby making just one wrong move that allowed me to win. Followed up Hive with a game of Guilds of Cadwallon. Finally getting a chance to play this after having it since the Kickstarter delivered. We played with just the base game, no extras. Not a lot to it, just a basic area control game on a grid. We'll see when the next time I get to play it is. Gabbby won this one since I kept getting stuck with picking up the militias. After Guilds we decided to relax with a walk through the woods and played Morels. My wife was going to play but Gabby wanted to play and Kerensa decided to keep working on homework. I think after taking a risk by picking up the discard pile that had an angel in it, Gabby won this one too, but it was close. I kept pulling up the wrong Night cards and couldn't play them with the mushrooms since I had already cooked them. Last game of the evening was a fun learning game of Spyrium. I've been wanting to play this for a while now and finally got the chance. Game ended in a tie between Gabby and I at 58 points, I think I missed a few opportunities to score more and I know that Gabby did but she didn't even worry about the technologies, she just went for buildings and mining. Kerensa brought up the rear, which means it might be awhile before I get her to play it again. I really like this one, and I am anxious to get it to the table again, especially if I can play it with more than three. Money may not be as big of an issue with more players I have a feeling. Love Letter - Three players. A quick game of Lovecraft Letter, in which I won the first hand when I played awful, then lost the next, when I played well, and then, a friend of mine won the next 4 rounds, cleaning the floor with us. Zombicide Season 2: Prison Outbreak - Six players. It is, basically, the same game, but with a few extra rules regarding the berserker zombies, which i found neat, because they made the melee weapons much more sought after. We played in the first scenario, and though we did well at first, things started to go south once some fat zombies came out of the sewers and killed one of survivors. Then another reach the red level and we lost the slim control he had of the situation. Zombies started to poruing in numbers way greater than we could handle, and those damn dogs could reach us wherever we were in maximum two turns, usually in one. We did put up a fight, but we didn't reached the last objective point. It was a looong game, one that we shouldn't have start playing around 3am. It was fun, nevertheless. 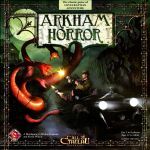 Arkham Horror - A four player game against Tsathoggua. The investigators were: Amanda Sharpe, the student, Lola Hayes, the actress, Luke Robinson, the dreamer, Bob Jenkins, the salesman and Rita Young, the athlete. We used only the base game (with many things from the Miskatonic expansion) with the Dark Pharaoh expansion. I do like this expansion pretty much, since it is really thematic and it gives a great feel to the game. We had some difficulties early on, but the player with Lola could make almost impossible rolls to get she out of dire situations. My investigator - Rita - with the Brasier of Souls and an Elephant Gun, was the terror of monsters. The high point of the game was when Luke Robinson, wandering around Yuggoth, got caught by Shub-Niggurath and devoured immediately! Bob Jenkins entered in his place and helped twice more than the dreamer had. When we had 5 seals around the board, and three investigators in the Other World, things were looking good for us, but one seal was bursted, and ony one of the three investigators had enough clues to seal (the others were there to try win without gates open, which wouldn't happen, since one opened in the Black Cave while they were there). But Bob found a fragment of an Elder Sign and passed to Lola, then she and Rita closed and sealed their gates, thus Tsathoggua was again put to sleep. Victory! Viagem no Tempo - A four players game. This is a game from a brazilian designer, and though the game isn't awesome, it is indeed well made, with interesting decisions, and play reather quickly (around 40 minutes). I couldn't manage to get some important cards, but used some scoring opportunities to, at least, stay somewhat close in points to the others, but in the end I still came in last. The game is good, but the cards aren't really balanced among them, some are better than others, and the better ones avoided me! Haggis - A three players game. It was my first complete game of Haggis, and boy, I did well. I ended up being the first to empty my hand in all the rounds, thus winning by a great margin - 285 to 166 and 89. I don't know if I had luck with the cards, or played well (a little of both, I guess), but my game just clicked with what I got. Arkham Horror - Three players. Another game of Lovecraft Letter, one that I started winning the first 2 rounds, then I lost 4 in a row, won again, lost, and when it was 3 / 3 / 2, I got eliminated by the use of Ithaqua (Baron). Then the player with 3 wins won again, holding Azatoth until the end. The winner was the same player that won the game Friday. He is a LL savant. Sentinels of the Multiverse - Two players. We played against Kismet in the Ruins of Atlantis, with the heroes Scholar (my friend) and Fanatic (I). We started well, specially because one environment allowed us to play two cards, use two powers and draw two cards, which was better for us than the extra card Kismet had. However, the Jinx cards were pilling up on the Scholar, so I played End of Days, to remove all the cards in the table. The Kraken, another environment, was really on the side of the heroes, beating the crap out of the talisman that belonged to Kismet and then another environment would take the rest of the hit points on the talisman, so Kismet only once or twice managed to give big damages to us. Even so, Fanatic fell when the Kraken attacked her, but, she still could help the Scholar, enhancing by 2 his damage (two Jinx cards were taking 1 point of damage each from the attacks made by the Scholar, so the help, though small, was paramount) and, when the Scholar, the talisman and Kismet, all had 5 hit points, the Kraken attacked Kismet and finally the villain succumbed. The bruised heroes took her to prison while the Kraken was looking to the other side. An timely victory, since we saw that the next card of Kismet would bring the Scholar down. This game is awesome! It was a good week where I managed to get in plays of heavyweights mixed with light games! The weekend actually started with disappointed, as my session with Paulo in order to teach him TRAJAN was cancelled. I was itching for some games and luckily at around 830 in the evening and I ask Keith and Kent if they were available to get some games in, and they were! Kent had been itching to try Macao again so I pick them both up and we go to a nearby McDonald s for a late evening session! The early turns were marked by good exchange rates of money to VPs. I build an early card engine to get money and thus get an early lead by the 2nd round. This was not to last long since Keith went for control of town areas and goods acquisition and thus was the first to ship several goods, while Kent REALLY went for cards to build a money engine, and thus he later used the money to buy a lot of VPs. However, Keith did not have a strong money engine while Kent did not do a lot of town control and shipping, while I on the other hand managed to do a bit of everything. I even purposely neglected activating a lot of my cards as with the Tea Storage and Captain I would score a lot of VPs by shipping Tea, and this is precisely what happened as my last turn had me score double for delivering tea and also some more points for delivering ceramics (20+ points for my last move!) and this was more than enough to compensate for the -15 points I got penalized with for not activating cards. As a result I win with a score of 65 to Keith's 51 (-3 penalty) and Kent's 45 (-9 penalty)! My activated (and unactivated) cards. Look at the -15 worth of penalty chips! Keith did a good job in activating cards, as he had only a -3 penalty. Keith had not yet tried the new roles from the expansion, so we get a couple of games of this new group favorite! Game 1: Bricklayers and Tax Collectors are heavily used as I just beat Kent in the race to 20 VPs! I win with a score of 20 to Kent's 19, while Keith struggled with the roles and thus did not claim VP cards when he could have, and scores 5 via the Tax Collector. Game 2: Keith requests a rematch, and we go at it again! Bricklayers were again heavily used early in the game to get more cards, but the late game had extensive use of the Peddler and Hunter as the we all searched for needed cards in the large discard pile near the end game. It was a close match again but Keith later vaulted in the lead. Kent and I did all we can to disrupt Keith, who at 18 points needed just 2 points to win. He however used the Hunter to grab cards from the discard pile to complete a set, then cashed that in for his 2nd action to buy a 4 VP card which brought his score to 22 for the win! Kent had 13 while I had 11. Keith finally gets his win, while Kent gets the "Cone of Shame" for not being able to win a game the entire evening! Sunday saw more gaming at McDonald's with Kent, Keith, and Paulo! This economic heavyweight of a game was finally brought out after a couple of months. Kent and I taught this to Keith by playing a few rounds with him until Pau arrived, and then we reset the game. And once it started it was a doozy of a game! The canal phase was marked by Keith establish a foothold in the Southeast by making cotton then shipping to the distant market. I had great cards to start in the northwest, and also established cotton mills, but I shipped them to my own port thus flipping them over and had a head start in income (after an early loan though). Pau and Kent did a lot of developing, and I took advantage of this by building my iron mills early and feeding off the coal of others. The late canal age had everyone establish a foothold on the map with a few level 2 industries (as all canals and level 1 tiles are removed after the canal age). Kent's lone shipyard proved too be the key VP boost as he shot out to 42 points in the canal age, distantly followed by myself with 29 and the rest in the low 20's or high teens. The subsequent rail phase was a flurry of activity, as people spent a lot of money and consumed a lot of coal in order to double build railroads and thus establish their new networks. Keith became a ports magnate in Liverpool while I was the opportunistic iron king as I build Iron industries when the distant market was empty, thus refilling the market and emptying my iron tiles, flipping them over immediately. I also developed and built cotton mills and again shipped them to my own port, thus letting me the undisputed king in income earning. This was too late for me to take advantage of though, as the other 3 players each built their own shipyards in the 3 locations, thus denying me a huge boost in VPs. I tried to compensate by building a lot of rail links, but this also helped Pau and Kent deplete and then flip over their coal factories. Pau also later went into rail building while Kent focused on industries, and in the end his initial lead in the canal phase plus a ton of points in industries made him overcome his lack of points in networks, as he scores an impressive 144 points. Pau was a distant 2nd with 124 and I was right behind him with 121 while Keith had 83, which is not bad considering this is his first game. The game of Brass: Lancashire took 2 hours (although it didn't feel like it took that long, as we were all involved in the game), so we lacked time for a medium length game. We thus brought out this game of Gamer Bingo! Kent and Pau had the initial headstart in the races, as they quickly finished 3 cheap objectives. Keith and I soon caught up, however, as Keith went for attack cards and also chaining abilities. I was the last in objectives since I focused on the higher point ones which took more symbols to complete. Keith then overtook everyone when he played the attack card which destroyed 1 finished objective from everyone else, and in the end this was the key as Keith reached 7 objectives to end the game, and upon tallying the scores Keith was tied with Paulo with 50 points each, but he won the tiebreaker as he had 3 senators to Pau's 2 . My focus on higher point cards paid off as I was just behind them with 48, while Kent's focus on low point ability cards cost him as he ended last with 40 points. Another weekday session at Jim's house! Jim and I teach Enrique this card game, although he initially had difficulty in knowing what powers to use so ended up drawing a lot of cards instead of playing them. Jim got the Agriculture card, which he used to score cards from a pile 1 higher than a card he discarded. However, this time I got the rules right thus Jim could not easily achieve and dominate the ages where he did have a card from that age played first. I had difficulty scoring cards to gain influence, yet I did manage to get cards which enabled me to achieve the special conditions for Military, Technology, and Diplomatic dominations. By the midgame Enrique and I finally had powerful cards which would enable us to start gaining a lot of influence, but Jim was slowly playing cards from the higher ages and thus he finally managed to dominate the 5th age and thus win the game using Agriculture. Jim has 25 influence and a 5th age card, and thus manages to dominate ages 1-5 and win! My tableau with 14 influence and 3 Dominations. Chemistry would have enabled me to gain a lot of Influence if the game did not end! Enrique with 14 influence and no dominations. He can simply charge this game to experience! This game of area control and dice manipulation and placement was brought out next. Much raiding and stealing was done in this game, as Jim and Enrique sped out ahead by building more ships, while I acquired (by theft and by purchase) a lot of artifacts to manipulate the dice. Enrique however, burned out his dice early by sacrificing them to terraform, and this cost him as he was not able to recover these later in the game. Jim wisely controlled the Alien Ship and judicious use of Terraforming as well as the Bradbury plateau makes him have an early lead in landed colonies. My control of Asimov's Crater then speeds up my actions at the Colonist's hub, and thus I start to land colonies and overtake Enrique. Enrique and I manipulate Jim's colonies by sacrificing artifacts, and the game was really close even though I had 1 less colony than Jim. He manages to roll 3 1's however, and thus gets to land his 7th and game ending colony and overtakes me for a 1 point win, as he scores 10 to my 9 and Enrique's 6! 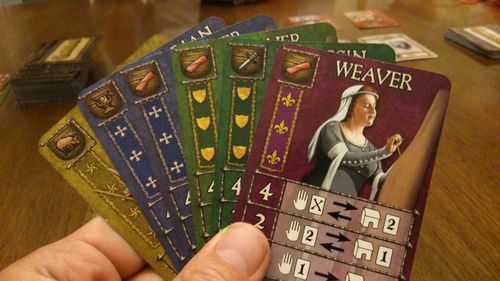 Enrique wanted to try out the new roles from Guildhall: Job Faire, so we get this card game going. Kent had just joined us by this time, so we got a couple of 4P games in. Game 1: Kent wins with a score of 21 to my 17, Enrique's 12 and Jim's 11. Kent appropriately used the Tax Collector role to the hilt, being the guy from Central Bank and all! Game 2: For this game we now put similar roles from both sets side by side, and then randomize which of each pair gets to be included in the next game. The result was that the Assassin, Bricklayer, Historian, Peddler, Tax Collector, and Weaver were used. This was a very tight game as everyone manages to complete a lot of sets and score the VP cards as well as get VP chips from the Tax Collector. On my turn in the final round I had 10 points and knew I had to gamble and score 10 points in order to win, otherwise anyone else would win as the rest were poised to reach 20. I had 2 completed piles and with my first action I bought a 5 VP card, and was hoping another 5 point card would be turned up to replace it. Well what would you this was exactly what happened, and thus I spent my 2nd action to buy this and thus am the first to reach 20 for the win! From L to R Kent 14 Me 20 Enrique 17 Jim 16. Close match! Compounded arrived in the hands of an attendee via Kickstarter. He relayed that his Kickstarter experience had been decidedly disappointing, having purchased four games, each something of a bust and one an out-and-out theft. He was hoping Compounded might break the string, but he had played it once already and had mixed feelings. 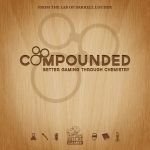 Compounded was one of the few 2013 releases high on my wishlist. Let's just say it ain't there no more. Problems abounded. The game was ultra-fiddly and had so much going on that it was difficult to manage all its bits, concentrate on playing, plan a strategy, and direct game flow. "Which phase are we in?" was a constant chant by the four of us, all experienced gamers. While some of this might be anticipated in a "science game," the extent of it led to a perpetual examination by all of why the game was so darned inelegant and clumsy given four years of playtesting. This was only accentuated by some amazingly poor design issues, such as near-microscopic text in numerous places, especially the player boards, and a design that muted many of the colors and images, making some iconography "fuzzy." Likewise, the game pieces bordered on minuscule. In the end, my high hopes for this game were utterly dashed by all its nonstop accounting and management issues, which made it a chore to play. In fact, after we were done two hours later, whenever a mistake happened in playing our next game, we blamed it on the brain drain of Compounded. Needless to say, for the game's owner, file this one as yet another Kickstarter failure. 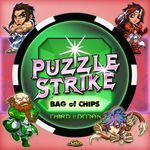 Puzzle Strike (Third Edition). I had not played before, but with elements similar to Dominion, it didn't seem like a stretch. While the game proved decent, it didn't wow me, and I thought the constant manipulation of the chips was no improvement over shuffling cards endlessly in a deckbuilder. I pulled out a win, but only because another player misplayed. Oh well. Hanabi saved the evening. The owner of Compounded busted out his new copy, and four of us played. The grimness of our Compounded play vanished in the simplicity of this SdJ winner, which elicited thrilling positive tension as we tried to learn each other's communication style and play the correct cards. Two of us had played it together before, but the other two were new, including the owner. Even though we made some mistakes and only made it to 18 points, Hanabi left us invigorated and happy. And isn't that what gaming is all about? Trains. I'd played a four-player session a few weeks back at my FLGS, but I played the other side of the board this time (Osaka). My son had not played Trains before but knew Dominion well. He picked it up immediately. As I was playing Trains, I wondered if it is a better deckbuilding recommendation than Dominion. I don't feel that Trains has the same level of meaty complexity that Dominion offers, but it also doesn't have some of the baggage, such as constantly mentally tracking the number of remaining actions and buys. In short, good choice by the designer of Trains as to what to streamline. 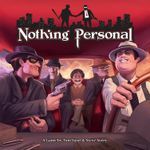 I mentioned in my previous review of Nothing Personal that Trains truly excels in card stock. I find the cards in Trains, though a little rigid for riffle shuffling, perfect in their robustness for a deckbuilder that will require constant card manipulation. 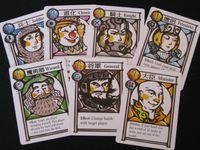 The cards in Trains appear plastic-coated and probably don't need sleeves, far unlike their Dominion counterparts. The best part of that? You save on the cost of sleeves and can use that cash to buy the next Trains expansion! So while Trains does not replace its venerable progenitor, I think it may be a better bet for anyone who hasn't jumped on the Dominion bandwagon yet. No, it's not as deep, but it has a superior elegance in play. And hey, the difference in card organization and storage is way in Trains' favor too. AEG did this one right. This week featured a surprising amount of gaming. I know this is a "weekend" list, but I usually post everything from the previous week anyway, just because it's not usually too much. If this keeps up (it won't) I'll have to rethink that. To be fair, all but the first 4 of these were played on Friday, Saturday and Sunday. Tammany Hall - I've had this game for about 8 months now and haven't been able to get it to the table until this week. The biggest obstacle was player count. It's relatively easy for me to get 2 player games played because I play with my wife. Games that require at least 3, though, only get a lot of play if they are light enough for my family to enjoy. I've brought this to game meet ups many times, but haven't ever pushed it and we always ended up playing something else. This week, I pulled it out of my game bag and said, "I've been trying to play this for over 6 months now," and 3 other people immediately jumped at it. It's a lot of fun. Area control, blind bidding, and negotiation all play very big roles. The rules are actually quite simple, and after the first election cycle, everyone had the idea down. After the second, they had a handle on how slander and the different political offices worked. And after the third, everyone teamed up to keep the leader from running away with the game. It's definitely a leader bashing game (if player negotiation and alliances don't enter the mix early enough, you will have a runaway leader problem), and I know that's a turn off for some, but if you can enjoy that, and you have the right group, it's a ton of fun. Mascarade - This week's game meet up started with a couple of 7 player games of Mascarade. Lots of fun and laughter, many moments of people being absolutely sure of what their roll was, and then discovering that they actually had no idea. It's a bit chaotic, but a lot of fun, and a great opener. The Manhattan Project - My wife and I had an unexpected free evening this week and were able to sneak in a game of this. We added in a couple of expansion modules (Nations and Famous People) and really enjoyed what they added to the game. My wife won by a large margin when she built her third uranium bomb while I was still trying to put together a smaller plutonium one for testing. Still very eager to get a play in with more players. Hive - I'm not usually much into abstracts; one or two games of Chess every 2 or 3 years is plenty for me. But I've heard so many good things about this game that when I saw it was free for iOS this week, I went ahead and picked it up. It took about 5 minutes to learn and I played about 5 games in the next hour and a half or so. I was surprised by how much I liked it. It played faster and felt a lot lighter than Chess, but was similarly strategic. I may have to pick up a physical copy. 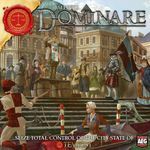 Dominare - This is a game we were really excited about a few months ago. Bought it, played it once, really liked it, and then didn't play again until now just because we've had so many new games recently. We had to re-learn some aspects of it, but still enjoyed it a lot. The strategy in chaining your conspiracy together makes for some very interesting decisions. I thought I had this one won when I was able to get a majority in most of the areas and manipulate the scoring of each to my advantage, but I shot myself in the foot by letting my conspiracy be over exposed and my wife ran away with it by claiming spaces on the board worth points. 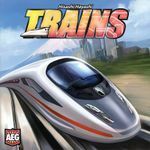 Trains - Discovering deck building was probably my first "wow" moment with modern board games. I'd played new games before and had fun with them, but was never blown away by a mechanic like I was the first time I played Dominion. Since then, I've probably become a bit more enamored of worker placement games, but I do still love a good deck building game, and Trains definitely fits that bill. Like Dominion, it doesn't have a ton of theme, but having the board adds just enough to the core idea to make it fresh for me. In this game, we split the bonus locations and my wife focused on smaller cities while I wrapped up the two 3 station cities and a few others. I took a gamble and ended the game one turn before she was able to lay rails into one of my 3 station cities. I was too late, though. She won by a single point, as she had been buying towers without me realizing it. Resident Evil Deck Building Game - I went to a local Saturday game day for the first time this weekend and got in a lot of gaming, including a few new things. This was the first thing I played. I wasn't actually crazy about playing it because I've heard almost nothing good, but someone needed players so I decided to sit in. I liked it more than I thought I would. It's a deck builder, which is a mechanic I enjoy, but it's also one of those games where every once in a while you're going to draw in such a way that you never do anything (one of the players had that happen, actually). With a little planning and a lot of luck, I jumped out to an early lead, but ended up in second (or third?) after the guy who owned the game got an overpowered (his word, not mine) special weapon. I'm not going to buy it, but I'd probably play it again. China - This is starting to get kind of long, so I'll try to be brief from here. This was another new one to me. This is a pretty good gateway style, area control game. It feels a little like Ticket to Ride, with maybe some Carcassonne style scoring mechanics. Another one I won't buy, but that I'd definitely play again. 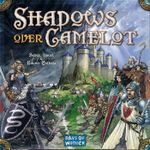 Shadows over Camelot - Really love this game, but haven't played it in a while. The mechanics are simple, the traitor aspect makes for a lot of laughs. We played with 6 and ended up losing. Mostly, I think, because some new players underestimated how quickly siege engines accumulate. 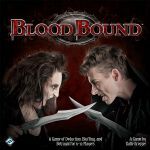 Blood Bound - This was the only other new to me game that I played, and I'm going to be buying it. Surprisingly good game. If you like social deduction games, this is really worth trying. I love Werewolf, but outside of conventions it's hard to get the player count you need. The Resistance is fun, but is basically broken if any of the players are playing too casually (i.e. not thinking about how they are voting for mission teams). This game has much more straightforward logic and strategy. There aren't any balancing issues, because there are 2 equal teams. And it plays in about a half hour at the most. Hanabi - Finished off the Saturday game day with a play of Hanabi. Three of the five players had never played before so there was some stumbling, but we ended up with a score of 17, so not awful. This was also the first play of me retheme, "whedonabi." I had a custom deck printed with characters from 5 different Joss Whedon works (Buffy, Angel, Firefly, Dollhouse, Avengers), because I thought fireworks was a little boring. Biblios - Saturday night, my wife, who had been working all day, wanted to get in a quick game of something before bed, so we played a round of Biblios. Love this game, it plays quick and has a decent amount of strategy without being any kind of a brain burner. 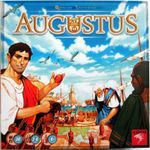 Rise of Augustus - As usual, we spent Sunday night with my family and ended the evening with a few plays of Augustus. My father requested Poo: The Card Game again, which seems to be forming into a mildly disturbing trend. Luckily, I hadn't brought it this time, so we settled on this. We still really enjoy Augustus. Sure, the decisions are simple and it's basically Bingo, but it's a good time anyway. Five games or so with the kids. Nice, quick 2-player game! Friday Lindy and I played Cowboys. I got this in a geek auction last fall and finally learned it with Lindy this week. We played the first 3 scenarios, 2 on Thursday and one Friday. This is actually quite a fun and thematic game that recreates shoot out scenes from the wild west. In the first scene, Dave Tutt (Lindy) won against Wild Bill Hickock. The second one, in a bar, Wild Bill (me again) forgets to be facing the door while playing poker and Jack Mackall, who has a grievance against him, walks in, comes up behind him and shoots him in the back. But Wild Bill, not yet dead, gets a shot of adrenaline (from a card), gets up, moves around behind Jack and shoots him in the back to get even. He then proceeds to finish him off. In the third, it is the scene at the OK Corral. Doc Holiday and the Earps (me) do a lot of good shooting and win. This was well worth the $20 for an opened but unplayed game. Saturday, Lindy and I finally got Wasabi, one of the many games that we were going to play this month, to the table. SHe beat my quite badly. I then played a game of backgammon with my sweet little wife. She won before I even had a single player off! The 22nd we played the 2nd scenario of Robinson Crusoe: Adventures on the Cursed Island. Cool scenario where we just didn't make it to the end. Lost by one wood! Cool story bit: I explore the dark temple and find a rapier. Suddenly a savage comes and steals my rapier! I follow him and find him, dead. However, it was not a savage at all! He had a stylish hat and when we looted the body, we found a whip … we killed indiana jones! On the 24th and 26th I played a solo game of Guns of August. The French defended themselves good, very good, but eventually got overrun by the german hordes. On the 27th, Pluizebol and I played Dark Alleys. The new additions are very nice - I used a lot of accessoires to make my petz attractive, whereas she used her first four turns into creating an absolutely hate-filled Pony which earned her a boatload of points. Eventually, due to a poop-explosion in my shop, she won the game on the back of the end-game exhibitions (before that, we were about tied ... after that, she was ahead by 10-ish points. 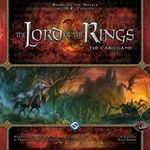 Four more solo plays of The Lord of the Rings: The Card Game with the Leadership Deck as I start to get to grips with how the game works. Past the first scenario and stuck on the second, but loving every minute of it, and carry it around with me on long days. 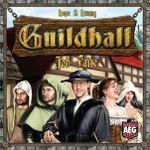 Three games of Guildhall, the last of which was our first with Guildhall: Job Faire. this brings our total up to four and I'm yet to win. Needless to say, my other half loves it, even if throwing in JF seemed like a little too much too soon, so we'll be leaving it out for a while before using it again, I think. I was pretty excited on Friday. As I was playing Balloon Cup on yucata.de, I thought to myself "I think I have enough stuff at home to make my own variant of this game". I have cubes from an old Risk game I thrifted, and I got cards made up that would work from a different variant I was working on. So, now I have a Marvel Heroes version of this game. And the best part is, I talked my wife into trying it out. She liked the game, but got made as heck at me when I played a card where she was about to play one. That was all I got played on Friday. On Saturday, I talked her into playing 2 more games of my version of Balloon Cup. I think I got a little lucky and won both of them. On Sunday, my daughter wanted to play a game with me. 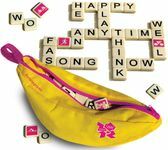 She picked out Bananagrams. I think we've only played this one other time since she got it for Christmas last year. A shame. On Sunday afternoon, my son and I finally got to play Battle Cry: 150th Civil War Anniversary Edition. He picked up on it really quickly. In the First Bull Run scenario, he soundly whooped up on me (he was the Union). We then played the Murfreesboro scenario. This time, Dad won with the Confederates. He really wanted to play this scenario. We were able to visit the battlefield this past summer when we were on vacation. We later found out that my son's Great-great-great-great grandfather fought in that battle for the 15th Illinois Infantry. This is a fun game and we really enjoyed it. I'm sure it'll get to the table more often. Still playing around solitaire with this one. Gamers group was off, and the wife was too busy with projects on short fuzes. I played Palaces for the first time in a few weeks, and it was good to play it again. I really love this game. I lost by a few points in a pretty tightly contested game. I took a gamble, and went all in early to get an eight point building so that I could get the green building point-doubler bonus. This set me behind on the endgame goals, but it was almost worth it as it netted me 44 points in the midgame. 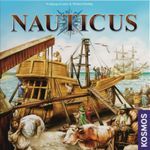 I got Nauticus in twice this week, winning neither time but having a lot of fun trying out different strategies. I'm hoping to get my hands on Coal Barons soon, and pull off a K/K trifecta in the near future. I've been wanting to try this out for some time, ever since I saw Richard Ham do a Runthrough. I liked it, though we played with quite a few rules errors, but I don't think they affected gameplay as much as they did scoring. Still, I'd like to give Pergamon another go in the future. I'm as surprised as anyone how much I like this game. Most people who know my tastes know that I trend heavily towards Euro-style games. For some reason, I find P:tACG very charming and I enjoy my every-other-week sessions playing Lini. Nothing Personal -- my first time playing this one; I liked it quite a lot. Merchant of Venus (second edition)--classic rules, of course. Another fairly quick (2 1/2 hours or so) game. 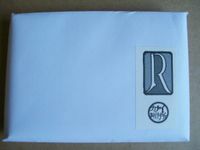 Love Letter--3x; this has become the default filler game for us. Modern Art--2x; I always bring this and never get it to the table; this time I got to play it twice. Fearsome Floors--a little Halloween-y goodness. EDIT: Lost Legends--tough game but fun. Thanks for the reminder, SM. I took Friday off to work on some things around the house and get ready for family coming into town. But before we got ahead of ourselves we had coffee and pulled Village out for a game. We did a quick refresher on the rules and jumped into it. Unlike previous games neither of us pursued or allowed the other to overpursue any given strategy keeping things balanced and in check from the start. In our plays of Village there are not many points scored until the very end so things looked fairly close and looking at the board we had fairly evenly matched travel, council, and church points so it was anyones game. Ultimately I pulled out a 55-49 win with my market tiles being the difference. Guildhall has taken us by storm this month. It's been exciting to have a game that my wife willingly asks to play nearly on a daily basis. She took this one quite handedly despite the 20-15 score... I gained five points on my last turn knowing I was going to lose which looks better than 20-10. 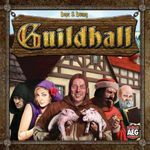 While our kids were at basketball tryouts and the rest of the family off apple picking my wife and I stayed home to get lunch ready and had some time to squeeze in another game of Guildhall. Ultimately I won 22-12 bringing our total plays (all this month!) to 38 with a 23-15 record in my favor. What started out to be a game where my wife had the advantage and then evened out has been falling into the typical 2-1 ratio in most of our 2p games. I'd love to find a fun, challenging game where the scales were tipped in her favor... and I think she would like that too! I'm thinking we might add the expansion for a different mix of cards if we continue to play and enjoy this game over the next month. Quiet weekend at home, but with surprisingly little gaming for me, as my husband had some work to do, as well as jobs round the house. 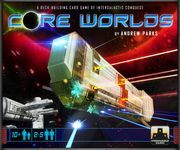 However, we managed two games of Core Worlds, a new MathTrade acquisition, one each day. I'm desperately waiting for my expansion to arrive in the post, as I much prefer it with the expansion! We also played Filthy Rich, an odd game of it in which twice during the game the gameflow was changed dramatically by a triple 1 roll - firstly in my favour, then back in my husband's favour. We also played Glory to Rome, which ended in a tie, as I ended it quickly in a bad position, but my husband just managed to catch me on points from his merchant action just before the end. We also tried Leonardo da Vinci 2 player, which I'm sure we have done before and it's worked, but this game definitely didn't - it may have been the order the cards came out in, but we were both desperately cash poor and there was almost no forward planning possible, as between us we'd do all three cards on each even numbered turn. My husband peeked at the deck a few times, but then forgot what was on top so it didn't help him, and I was lucky enough to pick up a card I could do in one turn on the last turn for the win. We also played a quick Race for the Galaxy before going out for dinner on Saturday night - great way to fill in ten minutes! I also played some games with my children - Pictionary Junior - in which my 3 year old has turned into a great guesser. He just needs to learn to read and he'll actually be not bad at playing this! Then their latest two favourites - Somethin' Fishy and Quit. I finally got to do some board gaming this past Sunday. My regular Sunday group kind of fell through except for one guy, so we went for two player games. Star Wars: X-Wing Miniatures Game - 1x - I still have some beef with how FFG just dumped Wings of War and then released X-Wing, but the changes do seem to be for the better. I did like the WoW preprograming 3 moves in advance, but the dial/template systems is much cleaner. I also like the dice vs hit decks and the face up or down damage cards. I may not buy into the system, but I would gladly play again. Twilight Struggle - 1x - This one is such a beast to teach/learn, but my opponent was ready. We played through to the end of the third turn where I ended up winning by victory points. My opponent said that he can definitely see why the game has such a following and that he gets "it" but he didn't really "get it". I think this means that he had fun, but the strategy was over his head in that first game. Hopefully he will be up for another game sometime soon. That probably won't happen until we are done with the last game of the night. Unpublished Prototype - 1x - My host's wife joined us for our first play of a game that we are playtesting for a known game company. I can't really say much right now, but it a lot of fun. We flubbed a couple rules that really would have added tension to the game, but we were all in agreement that we need to get this to the table again and really commit to the playtest. Our next proposed game night is this Friday. We are hoping for 3-4 plays then. We had a great gaming weekend with some Essen pre-orders arriving and friends around. We had two friends - D and F - around to game. We began with three-player Love Letter while we waited for our friend to arrive. Next we broke out Pandemic, which D had seen on TableTop, but never played. I warned D and F that the red bird flu would be the death of us and, indeed, it was - despite a quiet Asia for the first half of the game. We were defeated by multiple late-game outbreaks as we raced to cure the last two diseases. After that, F wanted to break out our copy of Zombicide: Season Twoand toxic mall, as he hadn't got to play his copy yet. We played with the works - the Dakota promo figure, zombie dogs, dog companions, berserk zombies and toxic zombies in the first prison outbreak scenario. Great game, much tenser and strategic than Season 1 alone. We played one character and one dog each. All the dogs got out, as well as D, F and I. My husband, playing Brad the gangster with a Magnum gun, was unfortunately eaten while driving a police car. I wanted to house rule the game so the dogs could drive the police cars, but was overruled. We finished with a first play of Nothing Personal, Tom Vasel's game of cartoon gangsters, screwage, kingmaking, backstabbing, blackmail, assassination and general skulduggery. I don't think the godfather card managed a single round without being arrested by the Feds, and half the crime organisation got arrested every turn thanks to the machinations of the other players. It was definitely game-of-the-day and I had a great time, despite coming last. A huge thumbs-up from me. We collected a big heap of Essen games and expansions, and played some of them in the afternoon. We began with two rounds of Lost Legacy, which I liked more than Love Letter, but my husband didn't. It's more complex, involves less bluffing and more memory, but it felt more strategic somehow and the theme reminded me strongly of the Professor Layton archaeology games on the Nintendo. In general, some of the most original games right now seem to be coming from Japan. I love the Japanese micro-games we own and Lost Legacy could creep into my Top 50. Sukimono is my pick for best Essen game. I've never laughed so much in a two-player game before. It's basically supermarket trolley dash the card game, a real-time micro-game about rooting through piles of teaware cards, looking for stuff to sell at a profit. Very funny, especially when my husband bought four of the wrong coloured spatula on the last turn of the game... and had nowhere to sell them... Hee, hee. Machi Koro was my third Japon Brand micro-game Essen pre-order and probably my least favourite of the three, although all are utterly excellent. It's a distillation of a resource optimisation and tableau-building game - kinda Fleetmeets Settlers of Catan... in ten minutes. My husband won by building a ranch-cheese-factory engine. It's clever and will go down brilliantly with the resource-optimisation nuts on BGG, but it felt less interactive than the other micro-games, less replayable (due to the fixed card set), and less fun. The graphic design is gorgeous though. We played two two-player rounds of Tash-Kalar, high-form variant. I really enjoyed this game and it could, potentially, creep into my Top 50. 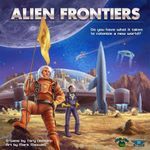 It's getting mixed reviews on BGG at the moment, mainly - it appears - because people bought it without reading the rules first. It is a semi-abstract game, very much in the tradition of Kingdom Builder or Tigris and Euphrates, but with Vlaadian humour and panache. It reminds me most of Rosenkonig, a wonderful game that mixes abstract mechanics with the imperfect information of card draw. But it's much more explosively tactical and 'skin-of-your teeth' in a way that reminds me of Innovation. The board state changes dramatically turn-to-turn meaning there's everything to play for and, although it appears chaotic, but there's a very obvious skill element (my husband is currently much better at the game than I am). The flare cards are a great catch-up mechanism, allowing you to place pieces if you get too far behind. Unlike most semi-abstract games (except Kingdom Builder), you win by fulfilling objectives to score victory points, NOT by taking your opponents pieces. I'm looking forward to playing it again ASAP and - hopefully - getting better at it. October is starting to look like a record month for games played, happily; thanks, in part, to regular visits from my daughter. I've always thought LNoE was an "ok" game, and have been quite happy to play it when requested, but A Touch of Evil has always been my favourite of Flying Frog's line. I might have to review that opinion, as we had an absolutely nail-biting two-player game on saturday. Both the dice rolls and card draws were tipped for skin-of-the-teeth plays, and it game to down to a final roll of the dice on the last turn of Die, Zombie, Die for my daughter to sneak the win. We had both been on our feet, looming over the table for the ten minutes running up to the end. Quite the most fun we had gaming, all weekend. Yeah, I know, it's almost universally adored, but I've always found it a little dull and dry - it's not something I'm ever going to suggest first for a game night. That said, I ended up really getting in to it this weekend (and was thoroughly routed by the kid). I guess who you play with is as important as what the game is. Getting a lot of play (and giving me a little breathing room from Pathfinder). I've got the first cycle of expansions and the first big expansion together now, but I'm still making decks with the core set - and trying to best that second and third quest before I advance too far. Game just keeps giving and getting better - even if I don't. Wish I could say the same for this one. We played this, again, but I have to say I feel less inclined to get it out after each time we play. We played with the recommended starter decks (and only have the core set), but this felt dry and my daughter seemed to end up facing walls of ice that she had no way of penetrating. It might be us doing something wrong, but a stalemate like that just feels like a chore. Packed it away, wishing I was enjoying it more. And it's just too impenetrable with it's nonsense terminology to teach to occasional gamers. Finally, something I can win at. One of the earliest games my daughter and I started playing together. I'm stunned people find this dry; the last third of the game, when every move can lead to death (well VP loss) is utterly nail-biting. A great game. A lazy, sunday morning, play. My daughter likes this so much we bought her a copy for herself and she's gone about teaching all of her pals to play it. If you're put off by the "M"-word, don't be. My in-laws liked it so much they take a copy on holiday and use it to lure in other hotel guests. Plays fast and allows for some vicious back and forth interplay. Great with any number of players, too. Had a few days away and came back fresh. Tried to run the monk through an early scenario... hadn't looked at him before given the lack of weapons and my assumption it would be a bit too tough. Yeah, I owe the wee fella an apology. Absolutely tore through every monster he came up against. Just had an email to say the new adventure pack is about to be mailed from bookdepository. Hallelujah for a week off. And Ghost Stories has just arrived in the mail. Better get used to being beaten again, eh? Games weren't on the agenda this weekend, but I somehow got a chance to play Saturday. 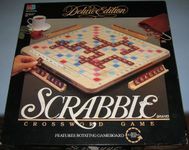 The first game up was Scrabble. It was my fiancee, dad, and I that played. My dad loves Scrabble and I enjoy playing it a lot as well. My fiancee started slow, but catapulted into the lead by playing a word using all of her tiles. She stayed in the lead and won the game by 60+ points. The next game up was a game that had been staring at me for quite some time now. The first time I played Bezzerwizzer I wasn't to thrilled with it, but decided to give it another shot as it has been a long while. I had a much better experience with it this time around. Not a bad little game. It's trivia, but I grew up in a household of nerds so this is a game that is right up my families alley. Also by this time my brother had joined the fun so we had four players. My dad ended up winning this game by stealing the points on a question my brother didn't know. If you remember last week I had a TTR filled weekend playing all the maps. 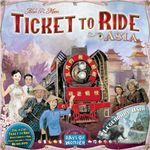 Ticket to Ride Map Collection: Volume 1 – Team Asia & Legendary Asia hit the table again, but we didn't play the reverse of this one though, the team side. We played a 2 on 2 game. My fiancee and I versus my brother and dad. Very interesting take on this game that I thoroughly enjoyed. I ended up basically doing my own thing as the routes we had for public knowledge were basically the same path. My own two routes together were for 30 points something I really needed to finish. My fiancee and I killed it. We won by 50+ points. My brother and Dad finished a whole bunch of small destination tickets which killed them. My teams tickets were all mid numbered to the higher end, but we had significantly less completed. Oddly enough her tickets finished near mine and we ended up wrapping around the entire board. As always hope to play more games this weekend. I always game on Wednesday, but I love it when I get to play on the weekend as well. A light weekend game-wise, with no gaming Friday evening. Played my daughter some Hive over Saturday lunch. 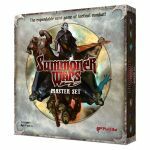 Saturday evening, my brother and I played a couple of games of Summoner Wars, pass-and-play style on his iPad. I beat his Vanguards with Cave Goblins, and his Guild Dwarves flattened my Jungle Elves. We hope to get in a tie-breaker this week sometime. 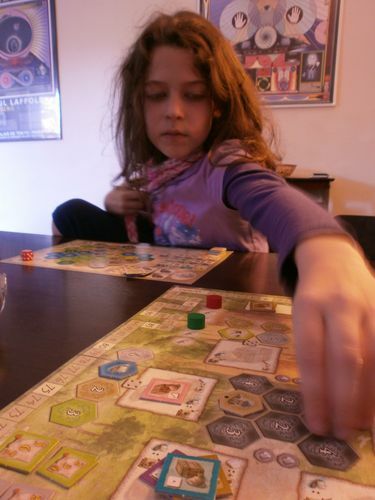 Sunday morning my girl played some Castles of Burgundy with me. And we wrapped up the weekend's gaming with another game of Hive in the evening. Thursday to Saturday I attended the Essen fair where, unlike the previous years, I managed to play a lot of games: I've prepared a geeklist listing all those I tried out (it's thirteen games!). 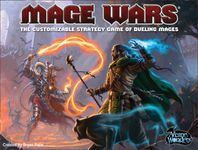 I was particularly struck by Mage Wars Arena: I had been wanting to play it so badly but while at home couldn't find anyone who owned it. Yet at the Pegasus booth there were no less than half a dozen Mage Wars demo tables, so I was able to play it twice, on different days and with different opponents: I think I'll buy it soon. I also fell in love with Mice and Mystics: I was sure I'd like it but, before purchasing, I wanted to play it at least once. I finally did it, under the supervision of the author, and as soon as the game ended I bought both the base game and its expansion. What a lovely game it is! Even BANG! 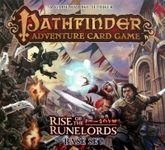 The Dice Game and Flash Point: Fire Rescue – Extreme Danger impressed me: the former keeps all the best things of the original card game discarding the boring parts (such as the painfully long length), the latter makes Flash Point more challenging and way more fun overall. As for the other games I played, I'll let said geeklist do the talking. 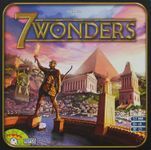 My gaming friends and I try to get at least one long board gaming session a month, this past weekend was our October session with our three most common players. Lancaster was a gift I received for my birthday earlier in the month that I had high hopes for and it delivered. 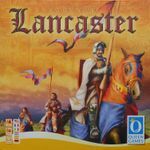 This one hit some of the same itches that A Game of Thrones: The Board Game (Second Edition) with the variable knight strengths and the battles to contest control of counties and the law voting was a lot of fun, though we voted down a lot of laws. It played pretty fast even for a first time play. I came in last by a big margin as I fell behind on both knights and castle extentions early and could never close the gap. Definite hit, thanks mom! Letters from Whitechapel was our find of the month last time. Jack completely baffled the police, we didn't even have his house in the right neighborhood when the game ended. We got a little overanalytical and his backtracking completely fooled us. Canterbury was our final game of the day. I just received this from a kickstarter campaign and have been looking forward to playing this one. It's more of a brain-burner than I had anticipated. The busy-ness of the board was a concern raised from one of my regulars, so it may be some time before this one gets back to the table. My sense is that there's a lot more in the game than we picked up this time around, so I'm hopeful it'll get a few more plays before we come to a final verdict. Very close game that I squeaked out in the end. Everyone won one of the games this day and we had a fun time. Lancaster was the big hit of the day. After I went home, my wife and I played a game of Scrabble, which I won handily. We've been playing this about once/month and she enjoys the improvement she's making as she plays more games of this and my game has definitely sharpened up with regular plays. We had a lot of new games to choose from in the wake of Spiel! was an instant hit, and got played not once, but twice over the weekend (once with 2 and once with 3 players). So far everyone has enjoyed it. Only problem is that it takes a lot of table space! Near the end of generation 3, some of the families started to look like they were inter-married, thanks to the close proximity of the cards! Wow, this game was heavy! I'm talking sheer weight of the gazillion components in the box, not the game itself. Fortunately it was the last thing we picked up in Essen so we didn't have to carry it around too long. The game itself was a lot of fun. I imagine its really close to Agricola, but as I've only played that once (a long time ago) I can't say how close. In the end I won with 1 point! Whoo! Been a while since I won a game. We were a bit out of practise and so from the 3 games we played, we only won 1. The others were lost due to a series of hilarious and badly timed mishaps. As it should be.